All-new 1.6-liter GDI Gamma engine paired with proprietary Hyundai six-speed manual transmission and Hyundai’s first EcoShift dual-clutch transmission. Up to 40 mpg highway (estimated). Better highway fuel efficiency than Honda CR-Z Hybrid. Standard multi-function seven-inch touch-screen display. Gracenote® display technology with voice recognition. Video game console connectivity with 115-volt power outlet. Blue Link Assurance provides a free introductory period of complementary core safety services including Automatic Crash Notification (ACN) and Assistance, SOS Emergency Assistance, and Enhanced Roadside Assistance. Blue Link Essentials provides Voice Text Messaging, Remote Door Unlock / Lock, Remote Horn & Lights, Panic Notification, Remote Vehicle Start, Alarm Notification, Quick Tips, Location Sharing, Automated Diagnostic Trouble Code Notification, Maintenance Alert, Monthly Vehicle Report, Recall Advisor, Web Vehicle Diagnostics, Stolen Vehicle Recovery, Stolen Vehicle Slowdown, Vehicle Immobilization, Valet Alert, Geofence, Speed Alert, Curfew. Blue Link Guidance provides Turn-by-Turn Navigation, POI Search by advanced voice recognition system, POI Web Search &amp;amp; Download, Daily Route Guidance with Traffic Condition, Traffic, Gas Station Locations & Gas Prices, Eco-Coach, Restaurant Ratings, Weather. 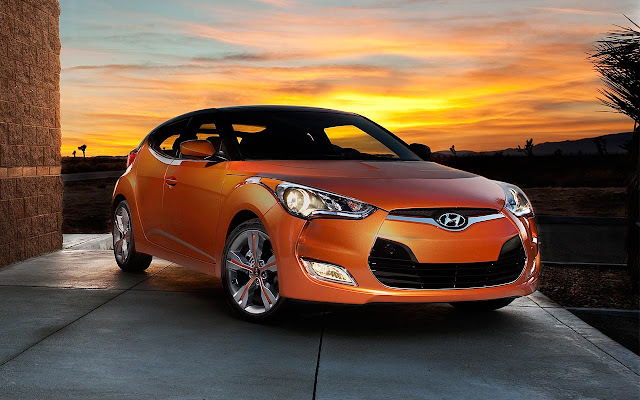 Veloster combines the style of a coupe and the functionality of a hatchback, while also incorporating an additional passenger-side door. In the past, some coupes have used smaller rear-hinged access doors. These coupes have always been compromised by having to open the driver-side door before the rear door could be opened, proving to be inconvenient for both the driver and passenger, and extremely difficult to operate in tight parking lot situations. 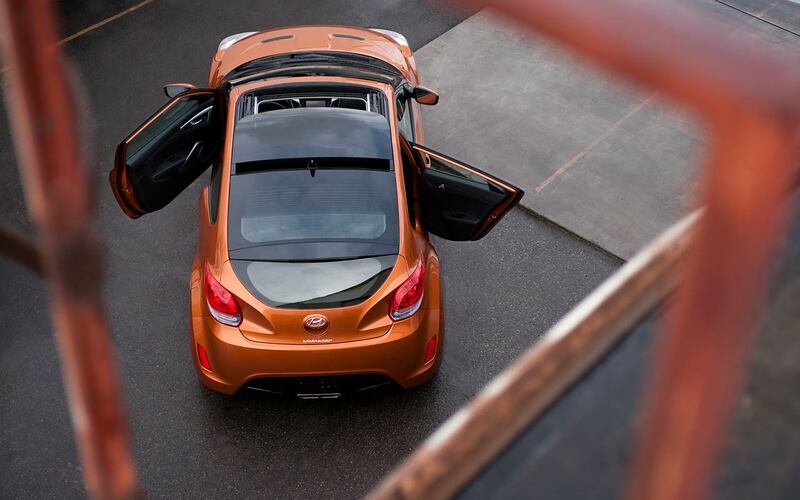 Hyundai’s fresh take here implements a conventionally hinged door on the passenger side of the Veloster, providing safe and ready access to the surprisingly spacious rear seats. The passenger-side rear door handle is hidden to maintain the coupe design. 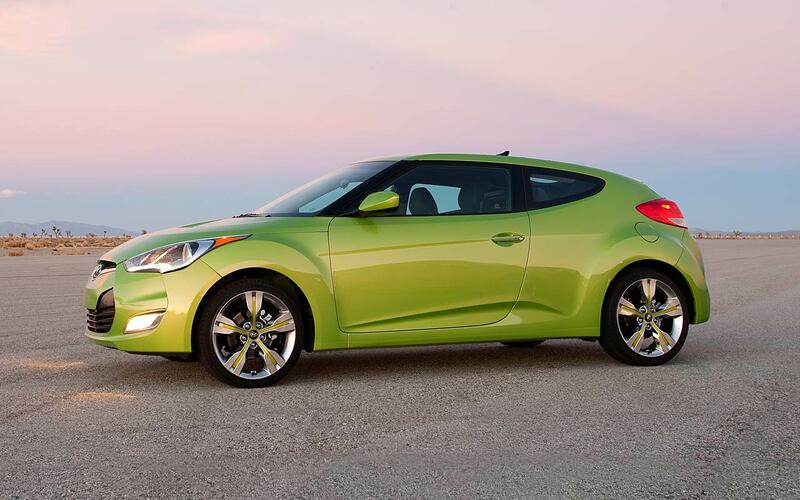 The all-new Gamma 1.6-liter four-cylinder engine is the smallest Hyundai engine to use Gasoline Direct Injection (GDI). GDI technology helps deliver estimated highway fuel economy of up to 40 mpg, lower emissions and higher reliability. Through the use of GDI, the Gamma 1.6-liter engine delivers a peak output of 138 horsepower at 6,300 rpm and maximum torque of 123 lb.-ft. at 4,850 rpm. But GDI is only part of the story as the new Gamma also features Dual Continuously Variable Valve Timing, an electronic throttle control, a roller timing chain, variable induction and innovative anti-friction coatings such as CrN Physical Vapor Deposition (PVD) coating and Diamond Like Carbon (DLC) coating. D-CVVT (intake and exhaust camshaft phaser) camshafts and hydraulic engine mounts provide optimum power, efficiency and refinement. Using CVVT on both camshafts has several advantages when compared to using it only on the intake camshaft including an improvement in performanc (increased volumetric efficiency) and fuel economy (reduced pumping loss), and a reduction in hydrocarbon emissions. Helps increase the reliability of the Gamma 1.6-liter engine. This system accurately controls air intake and engine torque, improving drivability, response and fuel economy. A Diamond Like Coating (DLC) was added to the tappets to help reduce friction in the valvetrain. Hyundai’s commitment to making the Gamma engine extremely fuel efficient continues by pairing it with a standard six-speed manual transmission or an all-new, six-speed EcoShift dual-clutch transmission (DCT) developed by Hyundai. 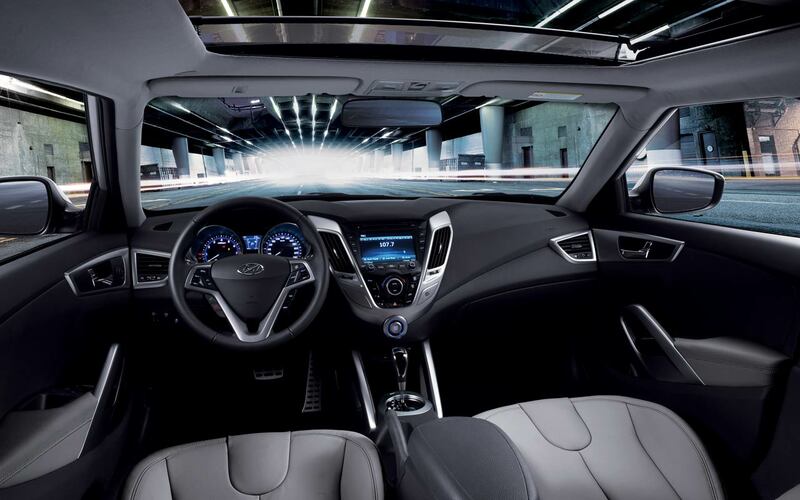 Hyundai’s new EcoShift DCT takes the benefits of a manual transmission, including low fuel consumption and sporty driving, and blends them with automatic transmission benefits, such as high comfort levels and smooth shift quality. In addition, the EcoShift DCT enables direct connection for high efficiency and uninterrupted torque transfer during shifts. Automatic transmissions lose power and fuel economy in the torque converter. Other improvements of a EcoShift DCT over a traditional automatic include a five to six percent improvement in fuel efficiency as well as a three to seven percent improvement in acceleration performance. 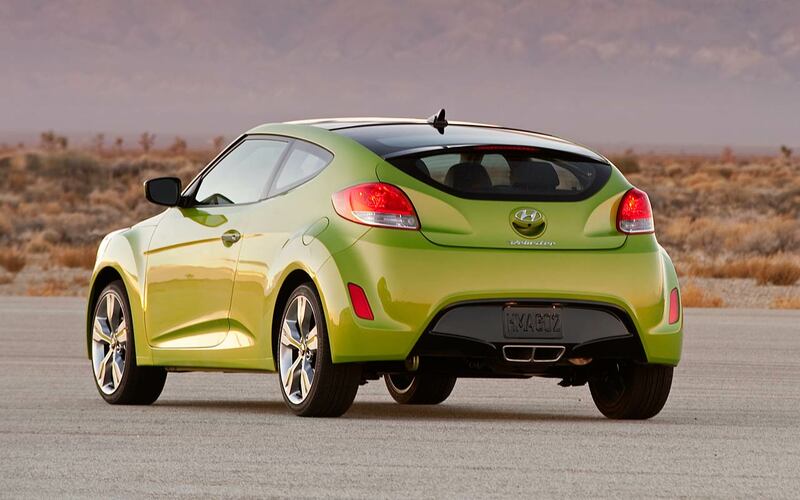 Veloster’s EcoShift DCT can be thought of as two traditional manual transmissions, each with its own clutch operating in parallel and alternating shifts. 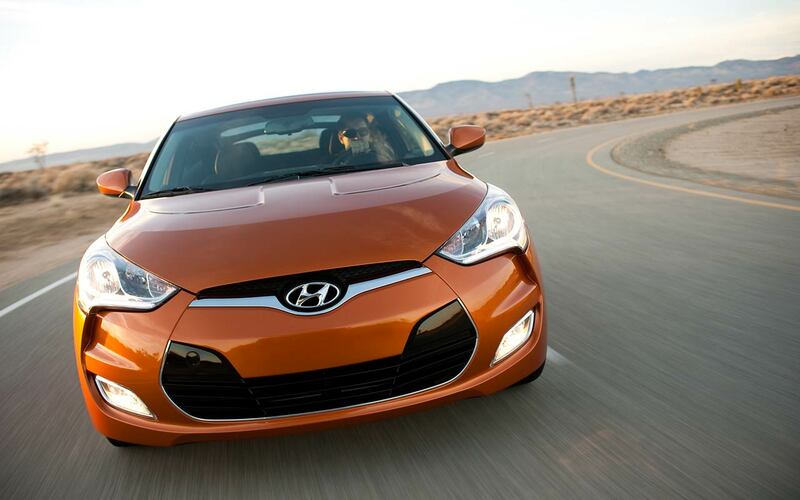 Veloster is a six-speed with one clutch acting on gears one, three and five and the other used for two, four, six and reverse. This shifting process results in quick smooth transitions with none of the efficiency loss normally associated with torque convertors. The clutch actuator assembly features electric motors for actuation, and an external damper improves NVH. This powertrain also has an Active Eco mode which modifies engine and transmission control for improved fuel economy that translates into more than a seven percent improvement in real-world fuel economy. The EcoShift DCT also incorporates Hyundai’s Hillstart Assist Control (HAC). HAC is designed to minimize rolling backwards on steep ascents.